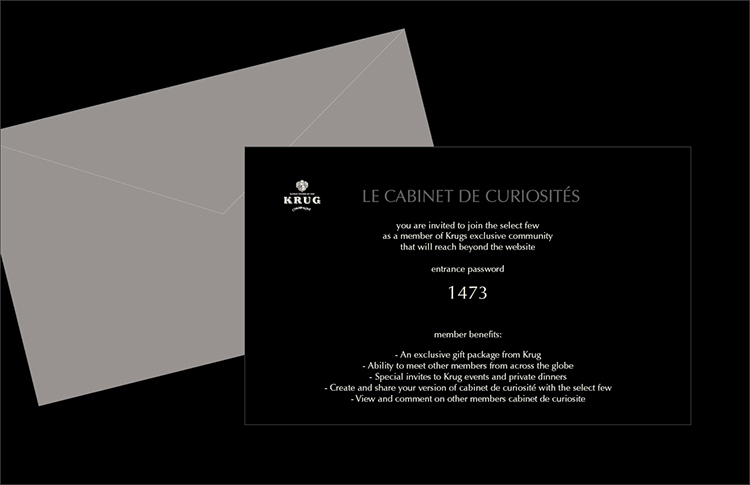 a printed invitation for current krug clientele, as well as select mailing-lists (amex black and platinum), requesting members to join-in on this special community site. 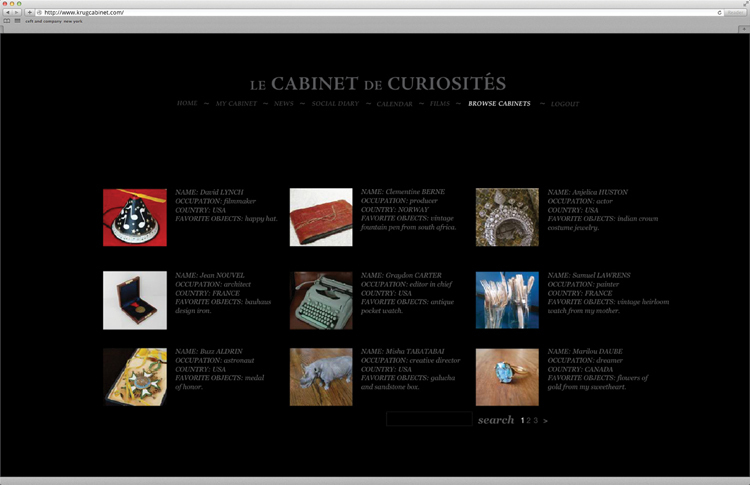 1- uploading your own, and browsing other members “cabinet de curiosities” and meeting like-minded members from around the globe with similar interests. 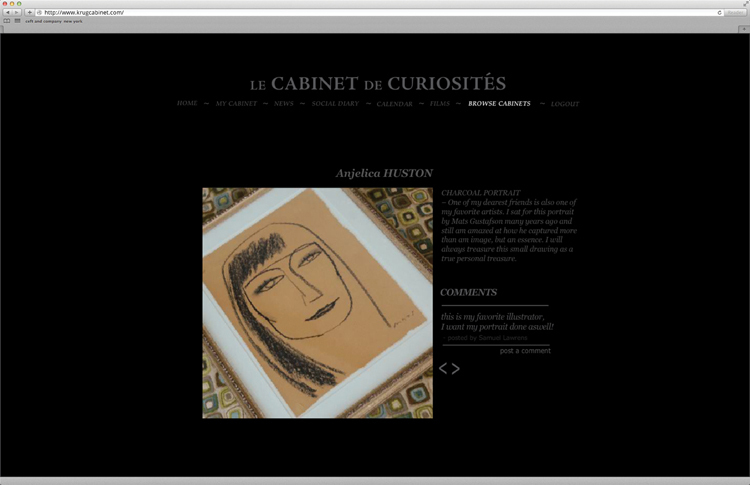 each member learns of others through their cherished items, be it a skull from the galapagos islands or a vintage minute-repeater watch, or in this case a simple charcoal portrait of anjelica huston done during the filming of “prizzi’s honor”. 2- view the global krug calendar of events and request attendance. invitations to krug’s pop-up anti-chambres (temporary champagne bars opened in undisclosed locations in key capitals during art auctions and fashion week) taking place in tokyo, paris, new york or london will bring together some of the members face-to-face for the very first time. 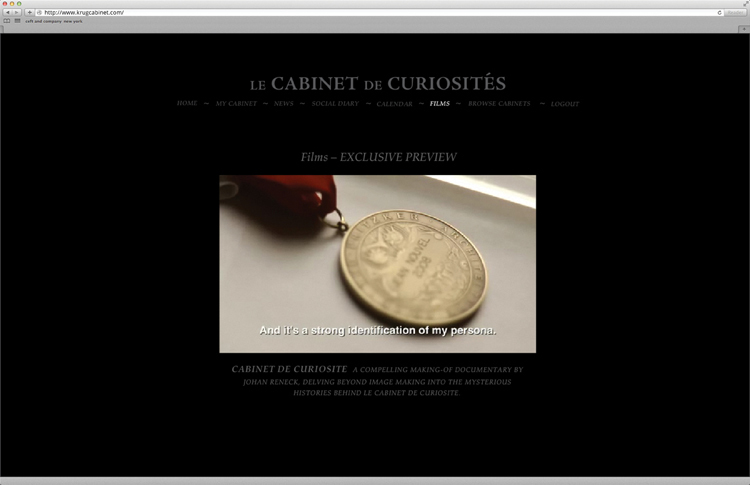 3- exclusive content and interviews are premiered on the cabinet site before becoming available to the public. the above film features notable krug lovers such as graydon carter and jean nouvel. the site also offers information on vintage releases and other krug-related matters. 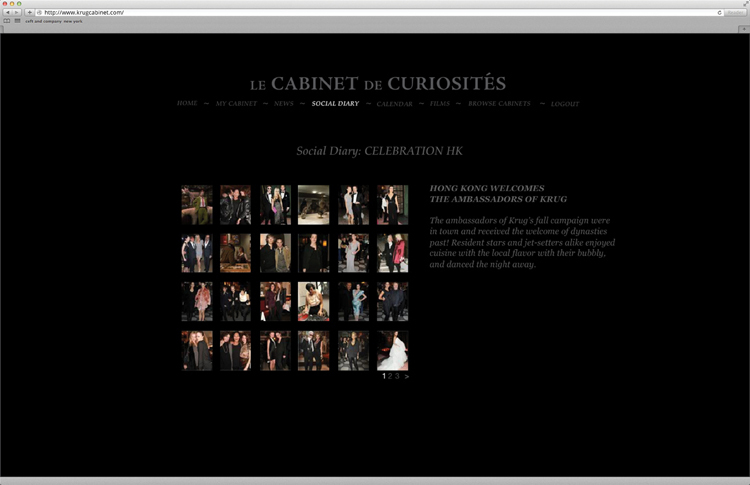 4- browse the social diary which will give you insight into the world of krug and those who cherish it as much as you. the original flash site can be viewed on ceft and company servers here. 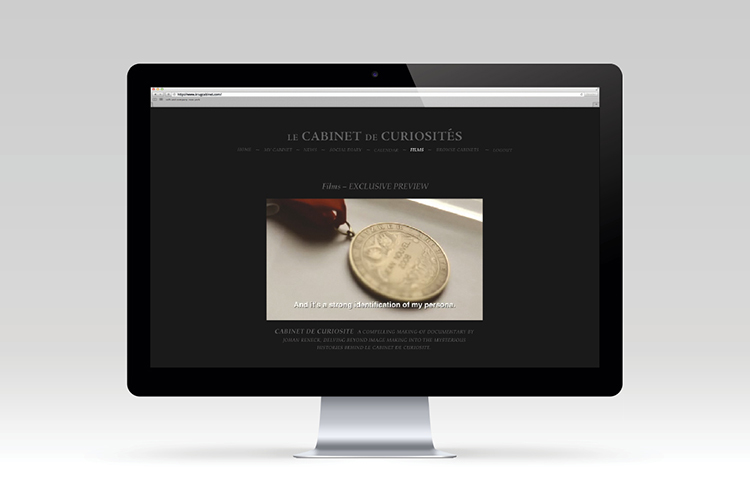 after the launch of the krug advertising campaign created by ceft and company, the agency proposed the idea of an exclusive, members-only cabinet social website. 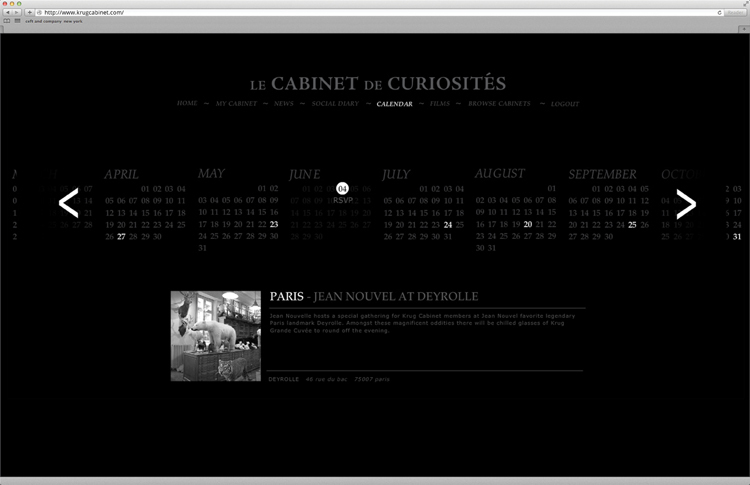 the site was to house exclusive content, such as video interviews with graydon carter, david lynch and the like to be released periodically, as well as an international annual calendar of events for all things krug. members could access the calendar and request attendance should they happen to be in tokyo or paris at that given time. most importantly the website was to be the destination not just for krug lovers, but for a very particular type of a person. someone with a specific taste for “all things” luxe. 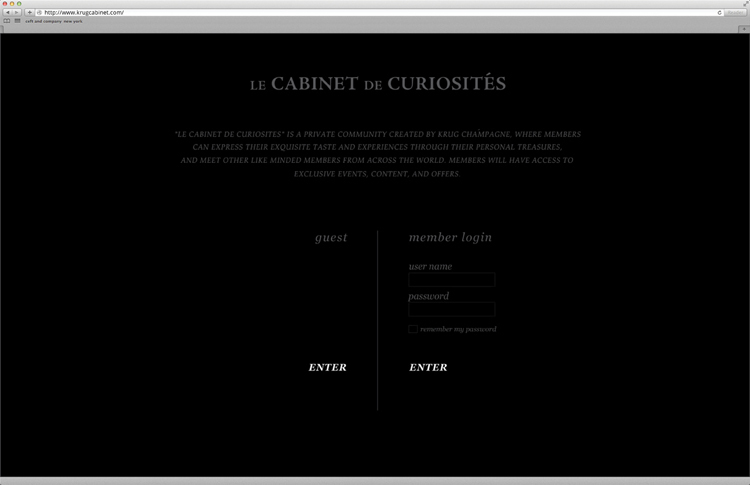 each member, upon signing, would be asked to upload their “cabinet de curiosités”. the krug community allows a select international group of individuals to connect often for the first time over mutual interests, comment and possibly meet one day on the opposite side of the planet at a krug event over a glass of champagne. this was not only a social website, but a smart way for a brand like krug to gather and give back to its very particular audience. the site would have the potential of becoming the very first, truly exclusive, luxury hub for all sister LVMH brands as the web becomes more and more the central focus of global luxury brands. view all work related to this project.